how timely. posting this for the benefit of my fans who don't read BITE (or don't have access to). please read through before going kris aquino on me. word. 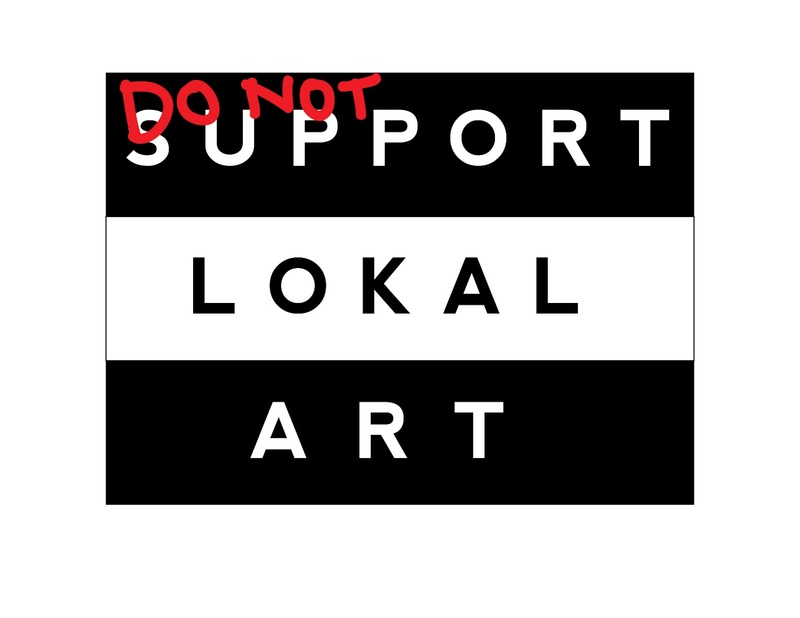 Do not support your local artist. I repeat, Do NOT support your local artist. That is not a typographical error and yes, you read it right. Now upon reading that opener, one might immediately take offense and ask at the back of his head, “Who does this arrogant schmuck think he is? What has this fucker got against the present state of local art and/or culture?” Or you would assume that I am lashing at it, out of bitterness and frustration, and just generally jealous of the current fad in the gall of good taste. I may be arrogant, bitter and jealous but believe me I am not “totally” anti-art. My main beef with the tired and clichéd opposite and supposedly optimistic slogan is this: it is not much with the “cause” itself but a far more relevant and pressing postulation which can be categorically summarized into one word: triteness. To wit, there is nothing more blasphemous than going to a hole-in-the-wall gig/exhibit and hearing the A-word being lightly thrown over and over again. More so, there is nothing more aggravating than blatantly seeing the “phrase” printed on some pretentious hipster’s undersized shirt. Reading “Save The Whale” or “Buy Now, Pay Less” would have been tolerable, but reading “Support Your Local Artist” is totally unforgivable even by the Vatican ruling and can only be redeemed by either a thousand lashes on the inner thighs or death by Flo Rida’s Low on the headphones on infinite loop 'til your cochlea turns to sardines or your brain into a dripping Slurpee. Heck, some even go to such lengths as whoring themselves with such tactless captions as, “I am a struggling artist, will do Art for food.” or “Feed me, I’m an Artist” (with double emphasis on the capital A). Newsflash: “Hitler called and he wants his caption back” and secondly, employing such crude tactics does not make you look as “cool” as you think you are. If you are suffering so much then why don’t you quit and go back to your 9-5 grind instead. Of course, this is not to say that I am against “artists who suffered for their art”. This is in no way a spit in the face of Kahlo, Van Gogh and their ilk(s). I have such faith in the creative denouement of brave human condition to the extent that I actually believe that the presumption “true artists suffer” is, in fact, the only universal truth there is, yet at the same time, way way far from the truth. This contradictory realization can be harmoniously explained in two-fold: 1) history never lies and 2) in the first place, it was their maladies, be it mental or physical, that made them submit to the marvel of art. Final point, which I think is the ultimate nail on the coffin for the persecution, is this: the words “support” and “local”, how does that equate to or fit the idea of you empathizing with the “artist” and his work? I mean, don't you actually have to “like” the artist before you can appreciate and support his/her stuff? Or is it merely an exercise in sheer apathy and lassitude out of politeness? Does it have to necessarily mean that all local artists are– for the lack of a better word – that “good” that you actually support all of them? Are we merely a race of non-scrutinizing idiots who can’t tell garbage from the good stuff and would immediately eat it when it is shoved down our throats? “But dude, you’re totally missing the point. The whole aesthetic of art is highly subjective…and who will support them first if not us?” Well maybe so, but that’s really besides the argument now, isn't it? (And I would say that these are two different points thrown altogether.) I would support an art or even the artist if I find it, well, likable and not because I am arbitrarily told by some bloke to do so. And, by the way, who are you to tell me that some crudely painted piece of enigmatic low-brow cinema art is in any way more “serious” than your Pollock, and vice versa? So the next time some rich kid tells you to “support” the “local” artist and, more so, that it is a part of the “struggle”, I want you to immediately punch him in the gut. (He deserves it.) Whose struggle? Fool, don’t tell me what to do. I can think for myself and will appreciate a good thing if I see one. There is no struggle. Do not, for a minute, think that there is. It’s up to you whether you sway or you stay. There is no sympathy in art. First published in Bite Magazine, 2009.